What are the gun laws in the State of Florida? There has been a lot of talk about new legislation regarding firearms, but what is the current status of the law as it relates to guns? Criminal defense lawyers know that there are plenty of firearm statutes with extreme high range of punishments already on the books in Florida. These laws are coupled with very long minimum mandatory sentences. 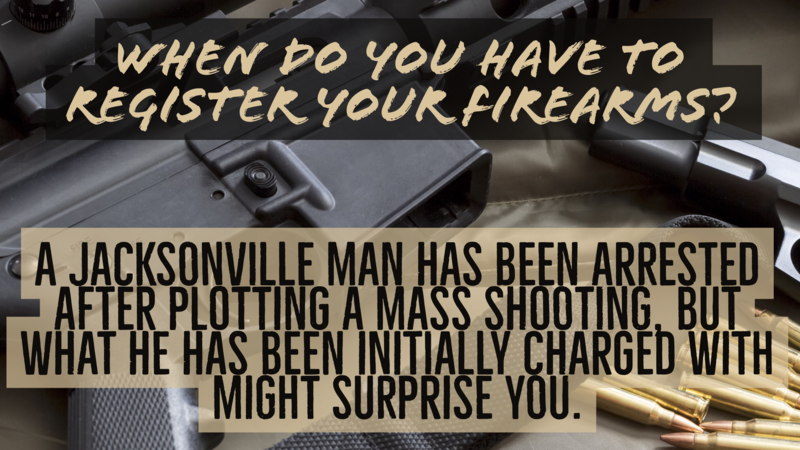 There are also many different and often overlapping state and federal laws regulating all aspects of firearm possession, use, distribution, manufacturing, and more. This blog will lay out some of the more common firearm statutes in the State of Florida. What are the common gun laws in the State of Florida? Bernandino Bolatete has been arrested and charged by criminal complaint in federal court in Jacksonville, Florida after threatening to a mass shooting at a local mosque. But what he has initially been charged with might surprise you? Rather than a charge related to a terroristic threat, Mr. Bolatete has been charged with knowingly receiving and possessing a silencer that was not registered to him in the National Firearms Registration and Transfer Record. 26 U.S.C. §5861(d) makes it a federal offense to receive or possess certain unregistered firearms. Included in the definition of a firearm under the applicable section is a silencer. Mr. Bolatete is charged with receiving and possessing a firearm provided to him by an undercover officer. In Florida, it is a felony for anyone who has been convicted of a felony in any state or federal court to own or possess a firearm. If the defendant is caught in actual possession of the firearm (as opposed to constructive possession), the defendant is subject to a mandatory minimum sentence of three years in prison. In a recent possession of a firearm by a convicted felon case south of Jacksonville, Florida, the defendant was a woman whose husband collected guns. The defendant was a convicted felon and could not own or possess any guns. After the husband died, the defendant ran into serious financial difficulties. To address this problem, the defendant and a friend went to a pawn shop and sold some of her husband’s guns. It was not clear whether the defendant actually touched any of the guns as the pawn shop clerk did not remember the transaction. The state was only able to recover the normal documents that are prepared in relation to a pawn transaction in Florida. Those documents showed the defendant did sign the pawn transaction form and had her fingerprints taken, as the law requires when a person pawns items he/she owns. She also received the money for the pawned guns. Based on this evidence, the state charged her with possession of a firearm by a convicted felon. The criminal defense lawyer filed a motion to dismiss the gun charge. He argued that the state could not prove that the defendant actually possessed the guns or was in constructive possession of the guns since there was no testimony about the details of the transaction. The court agreed that the state could not prove actual possession of the firearms, but denied the motion to suppress. The documents from the pawn shop that were available were sufficient for the state to proceed on the theory that the defendant constructively possessed the guns. The fact that she was involved in taking the guns to the pawn shop and pawning them for money was evidence that she had knowledge of the guns and the ability to control them, which are essential elements of a constructive possession charge. 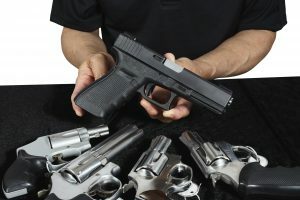 Can I Purchase a Firearm From A Federally Licensed Dealer For Somebody Else Who Isn’t Prohibited From Possessing A Firearm? Can you walk into a federally licensed firearm dealer’s shop and purchase a firearm for someone else? In other words, can your uncle Joe, who lawfully owns other firearms, give you $900 to go into the local gun shop to buy him a new semi-automatic? The United States Supreme Court has said, “No.” This sale, commonly referred to as a “straw purchase,” is illegal under federal law. Even though both you and your Uncle Joe can lawfully purchase firearms, it is a crime to do that if you are the actual buyer on Form 4473, if you are actually purchasing the firearm for a third party. In 2009, Bruce Abramski, a former police officer, walked into a local gun shop and purchased a firearm for his uncle. His uncle sent him $400 to make the purchase. Under federal law, the firearm dealer was required to record the buyer’s name, age and place of residence. Abramski filled out ATF Form 4473 stating that he was the actual purchaser. Abramski walked out and immediately transferred the firearm to his uncle. Both Abramski and his uncle were eligible to lawfully purchase a firearm from a federally licensed firearm dealer. Neither one was a convicted felon or otherwise a prohibited person. So, why wasn’t what Bruce Abramski did legal under the Second Amendment? This unlawful search took place in a Florida school south of Jacksonville, Florida. In this case, students at the Florida school reported to school officials that some other students were playing with a taser on school grounds. The school security officer spoke to some kids who indicated that the suspect was the one with the taser, however the suspect had gone home for the day. The next day, the principal and security officer had the suspect come into the principal’s office, and they searched her purse. They did not find the taser and let her leave for class. Later that day, they brought the suspect back into the principal’s office, searched her purse and found a taser. She was arrested for possession of a weapon on school property, which is a felony. The criminal defense lawyer filed a motion to suppress the evidence of the taser arguing that the principal and security officer did not have a legal basis to conduct the second search after the first search did not result in any incriminating evidence. The rules for searching students and their property are a little different in schools. Students and their property can be searched at a school if there is reasonable suspicion that the student is involved in criminal activity or evidence of a crime will be found. A search of a student at school is considered reasonable as long as the search is reasonable in scope. At schools, the more serious the threat, the more leeway the school or a police officer will have in conducting a more extensive search. In this case, because students indicated the suspect had a weapon on school property, the court ruled that the first search of the student was reasonable. However, since the first search was unsuccessful, the school could not conduct a second search of the same property later without new information that evidence of a crime was present. In other words, the school and/or the police only get one shot at a search based on reasonable suspicion, and if they do not find anything, they cannot go back for a second search later without some new evidence that justifies it. A second search of property that initially yielded no results is a search based on mere suspicion which does not meet the appropriate search and seizure standard. For the second search to be justified, the state would have had to present testimony of new evidence that was uncovered after the first unsuccessful search. The weapon charge was thrown out. In Florida, it is illegal for anyone to possess a “weapon” at school or a school-sponsored event without authorization. A violation of this criminal statute is a third degree felony that carries up to five years in prison. There are a variety of items that are considered “weapons” under the statute including razor blades and box cutters, in addition to the obvious weapons like guns and knives. There is also a separate Florida statute that adds other items to the definition of a “weapon” such as brass/metal knuckles, tear gas and slingshots. Whether other items are considered “weapons” under the statue is unclear. Pocket knives are specifically excluded from the definition of a “weapon”, but what is considered a pocket knife depends on its size and other characteristics. The obvious problem is that the Florida laws and statutory definitions do a poor job of telling students and parents what items are legal and what items could result in a felony charge. In a recent weapons case near Jacksonville, Florida, school officials conducted a random search of students at a local public school. They removed the kids from the classroom, scanned them with a metal detector and searched each of them. They also searched their book bags and other belongings. They found a BB gun in the defendant’s book bag. The school officials said the BB gun looked and felt like a real gun. It was not loaded. The defendant was arrested for possession of a weapon on school property. The criminal defense lawyer filed a motion to dismiss the charge since a BB gun is not a deadly weapon as referenced in the statute. That statute lists certain specific items that are considered weapons along with any other “deadly weapon.” BB guns are not specifically listed as “weapons” in the statute. Therefore, the criminal defense attorney argued that since the BB gun is not specifically mentioned as a “weapon” in the statute, and a BB gun certainly is not a “deadly weapon” as also mentioned in the statute, the defendant cannot be charged with possession of a weapon on school property for a BB gun. In Florida, a person enjoys special protection from illegal searches and seizures in his/her home or other residence. At a minimum, this means that police officers and other agents of the state cannot just come into a person’s residence looking for evidence of criminal activity without a search warrant or valid consent from someone who is authorized to provide consent. However, there are exceptions to this rule that would allow a police officer or other state agent to come into a person’s home. If they find illegal items such as guns or drugs once they are legally inside the residence, a criminal investigation can initiate. In a recent case south of Jacksonville, Florida, firefighters and police officers responded to a fire in the suspect’s residence. Police and firefighters are permitted to enter someone’s home without consent or a search warrant to deal with an emergency health or hazard issue like a fire. Of course, they must do so only for the purpose of assisting with the emergency and not for the purpose of looking for evidence of a crime. However, if they see evidence of a crime while in one’s home for other purposes, they are not required to ignore it. In this case, the firefighters entered and exited the house through the garage. While doing so, they saw drug paraphernalia on a table in plain view in the garage. After seeing the drug paraphernalia, the firefighters went back inside to make sure there was no additional fire threat and saw marijuana in a closet. They informed the police who detained the defendant. The police officers requested consent to search the house from the defendant. When the police searched the house, they found more marijuana, guns and drug paraphernalia. The defendant was arrested for possession of a firearm by a convicted felon and possession of marijuana with the intent to distribute. The criminal defense lawyer filed a motion to suppress the evidence of the marijuana, guns and drug paraphernalia arguing that the police did not have a legal basis (a search warrant or valid consent before the defendant was detained) to search the house. The court found that the search and seizure related to the marijuana and drug paraphernalia were legitimate. The firefighters had a legal basis to be inside the house putting out the fire, and they saw the marijuana and drug paraphernalia in plain view while legally in the house. They had a right to inform the police about those items. On the other hand, the guns and items found after the defendant was detained and the police searched the house were suppressed. At that point, the police were obligated to get a search warrant to search the house for additional evidence. They never attempted to do so. As a result, the defendant could be charged with possession of marijuana with intent to distribute and possession of drug paraphernalia, but the state could not go forward with any charges related to the guns due to the illegal search. In Florida, it is illegal for someone who has been convicted of a felony crime to own or possess a firearm. This applies to any felony conviction, so if a person who lives in Florida has a prior felony conviction from any other state, that will still prevent the person from legally having a firearm in Florida. In other words, the prior felony conviction does not have to be a Florida felony conviction. A possession of a firearm by a convicted felon charge is a serious crime in Florida. It is a second degree felony in Florida, which is punishable by up to 15 years in prison. Prosecutors often seek prison time for a first conviction for this crime. There can be many defenses to a possession of a firearm by a convicted felon charge. First, depending on where the gun was found in relation to the defendant, a defendant can argue that he/she was not actually in possession of the firearm. Or, a defendant can argue that he/she is not a convicted felon. Whether a person is a convicted felon seems fairly straightforward. However, in Florida, it may not be. When a person gets charged with a felony crime in Florida, he/she can either have a trial or enter a plea of guilty or no contest to the charge. If the person does enter a guilty or no contest plea, or loses at trial, the judge can do one of two things. The judge can adjudicate the defendant guilty. This means the judge is finding the defendant guilty which is a conviction under Florida law. Or, the judge can withhold adjudication of guilt. This means that the judge is not technically finding the defendant guilty (although he/she may have admitted guilt or been found guilty). As a result the defendant is not a convicted felon. Therefore, he/she is permitted under Florida law to own and possess firearms without concern for this criminal statute. In criminal cases, DNA evidence is often seen as a strong indicator of the defendant’s guilt. Not many cases have DNA evidence presented by the state, but when the state does present DNA evidence, juries usually take note. DNA evidence is certainly well established evidence at this point that can be difficult for a criminal defense lawyer to refute. However, DNA evidence does not necessarily mean what the state wants it to mean or what the state argues it means to the jury. In a recent case south of Jacksonville, Florida, the police responded to a burglary call. When they arrived, they arrested the suspected burglar and then checked the apartment for evidence. Inside the apartment, the police found a gun in the bedroom. Because the occupant of the apartment was a convicted felon, the police arrested him for possession of a firearm by a convicted felon. Although it is rare, the police tested the gun for fingerprints and DNA and found viable DNA on the gun. The DNA matched the defendant who lived in the apartment. The police also found the presence of other DNA on the gun but did not test any of the DNA to see if it matched with the burglar. The state argued that since the gun was found in the defendant’s apartment and had his DNA on it, the defendant was guilty of possession of a firearm by a convicted felon.